The wait for Yuvan shankar Raja fans is over. Come 8 May, the audio of Suriya's Masss will be out. Directed by Venkat Prabhu, Masss stars Suriya, Nayanthara, Pranitha and Premji Amaran among others in the cast. The music of the upcoming Suriya-Nayanthara starrer "Masss" is one of the most-awaited albums for the summer. After a lot of speculations and rumours, the makers of the movie have confirmed that the audio launch will take place on 8 May Eros Music will be releasing the audio across the globe. The audio release poster of this mass romantic thriller released today with the release date of May 8th. Studio Green, the producers of the film have earlier announced that the film will be releasing on 15 May. As predicted earlier there won't be any mega audio launch function and the album will be released in stores, iTunes and Google Play. 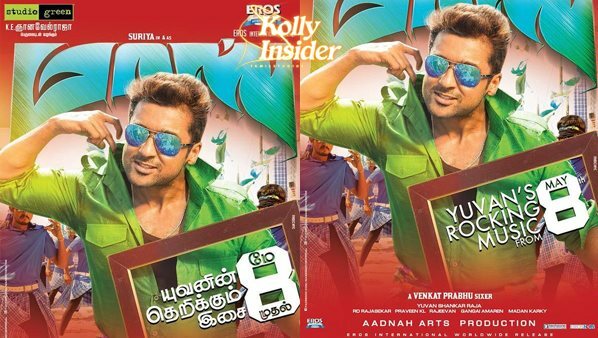 The music of "Masss" has been composed by Yuvan Shankar Raja and the album has seven songs. The first look of Masss teaser was out recently and it garnered more than two million views in YouTube.